This is an excellent fruity tastng wine! 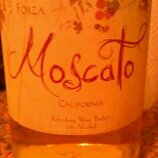 I recently discovered there are many brands of Moscato ou there. This one is particularly sweet. If you aren't a heavy drinker like me ou will truly appreciate the flavor of this wine. California wines tend to contain less alcohol than Italian wines. This wine is great with dinner or dessert. Yummy!